These fish kebabs are made in the microwave for an extra speedy meal. Step 1 Thread the fish pieces onto 8 bamboo skewers. Place in a single layer in a shallow glass or ceramic dish. Step 2 Combine the oil, lemon rind, lemon juice, oregano, garlic and cinnamon in a jug. Season with salt and pepper, and whisk with a fork until well combined. Pour over the fish kebabs and turn to evenly coat. Cover with plastic wrap and place in the fridge for 1 hour to develop the flavours. Step 3 Drain fish kebabs and reserve the marinade. Arrange fish kebabs in a single layer on a large, heatproof microwave-safe plate. Place the plate on a microwave-safe rack or upturned dinner plate to elevate. Loosely cover the fish with 2 sheets of damp paper towel and cook for 5 minutes on Medium/500watts/50%. 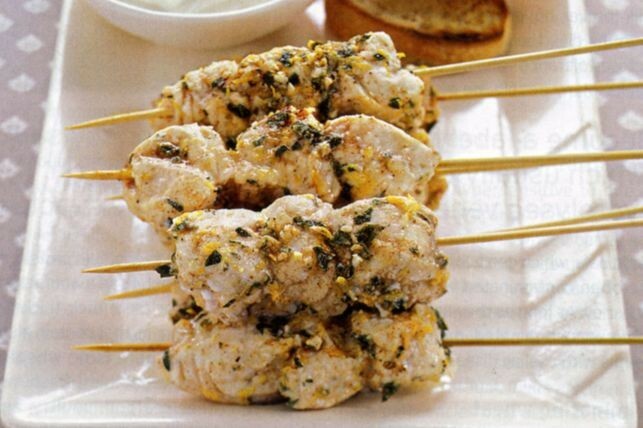 Brush the fish kebabs with reserved marinade. Turn and cook for a further 5 minutes on Medium/500watts/50% or until the fish is just cooked through. Step 4 Serve immediately with tzatziki and toasted sourdough, if desired.